Over 1 Million (custom printed t-shirts) Served! That’s a lot of screen printing and embroidery customers… Our machines are constantly running to fulfill the hundreds of orders we receive each year. Time after time, customers refer their friends and return with repeat business. We are grateful for our loyal following and look forward to faithfully supplying each client with the highest quality, service and value. 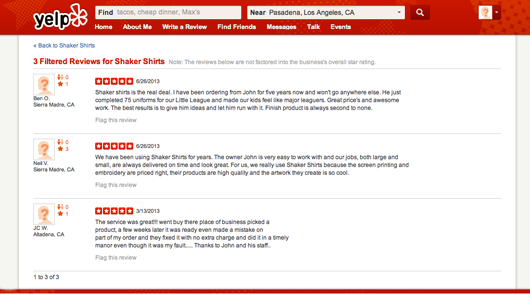 That’s why Shaker Shirts is the trusted custom silk screen printer and embroiderer recommended throughout Los Angeles, Pasadena and the San Gabriel Valley.